At Ronald Reagan High School, the band program combines with award-winning programs in art, choir, debate, orchestra, and theater to form the remarkable Fine Arts department. The Wind Ensemble, a 45 to 60 member select ensemble, is the top performing group in the band program. With an enrollment of 300 students, the comprehensive instrumental program at Ronald Reagan includes four concert ensembles selected by audition, Symphony Orchestra, Musical Pit Orchestra, Jazz band, various Chamber ensembles, Color Guard, Winter Guard and the Marching Band. Our students participate in the Region XII All-Region Band and Orchestra as well as the Texas All-State Band and Orchestra each year. 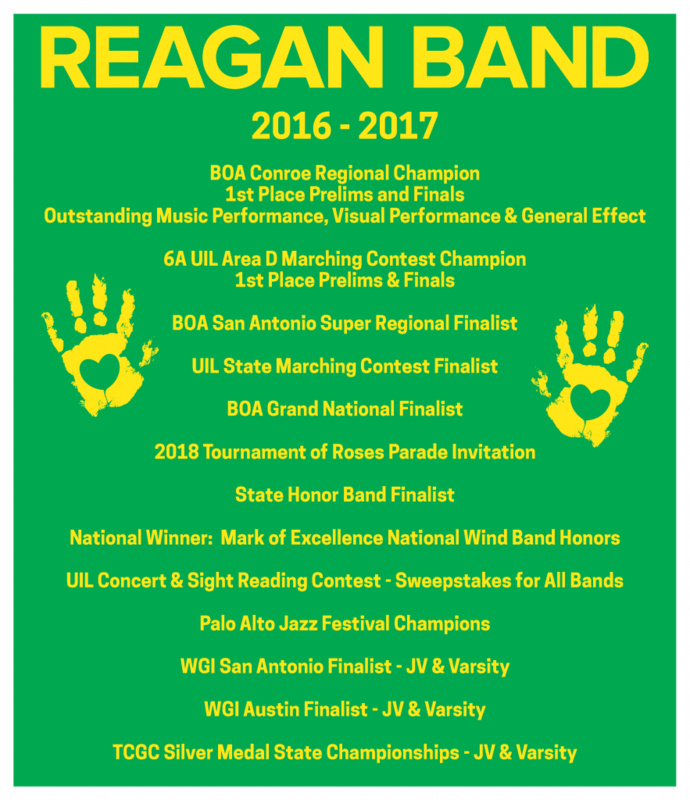 The Reagan Bands have enjoyed numerous Sweepstakes awards and Superior Rating at UIL contests. The Marching band has received numerous awards as an Area participant and regular finalist performances at Bands of America competitions. The Reagan Band’s most recent achievements include being selected to perform in the 72nd annual Midwest International Band and Orchestra Clinic in Chicago Illinois, Marching in the 2018 Tournament of Roses Parade, and being selected to participate in the 2019 Macy’s Thanksgiving Day Parade. Click Here to view our Media Page. North East ISD students begin band in sixth grade, and those attending Ronald Reagan come from two middle schools: Barbara Bush Middle School (Gabriel Rosas and Erin Sharkey, directors) and Jose M. Lopez Middle School (Kim Garza and Jessica Powell, directors). In middle school, students begin their instrumental instruction in homogenous classes and then participate in concert bands in seventh and eighth grade. Credit for the strength and success of the Ronald Reagan HS band program must be shared with these committed middle school teachers. 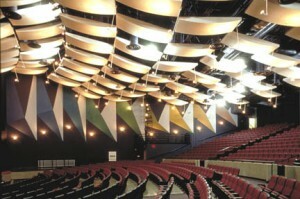 Ronald Reagan High School opened in 1999 and is one of seven high schools in the North East Independent School District (NEISD). There are 2700 students on the 82 acre campus located in the far North Central area of San Antonio, Texas. Recently, the Texas Education Agency has rated Reagan High School as an Exemplary School. The NEISD consists of approximately 140 square miles in the north central and north east sectors of Bexar County, Texas. The majority of the district lies within the boundaries of the City of San Antonio, but several smaller communities are also encompassed within the district, including the cities of Castle Hills, Hill Country Village, Hollywood Park and Windcrest. Led by a strong Administration team and Board of Trustees, North East ISD is home to more than 66,000 students across 63 campuses, 12 magnet programs, eight alternative schools and close to 9,000 employees.